My hope is that this comic is bringing attention to the fact that the Bible and Christianity are truly no threat to “Unit Cohesion” in any service or government entity. In fact, a stronger Christian presence in any group, government or civilian, is just what this country desperately needs. The recent rumors of Christians in uniform being singled out and ordered to not engage in any sharing of their faith for fear of military punishment is highly troubling, if true. Christians aren’t perfect, but are “Saved” by their faith in Jesus Christ. Think of Christians as “works under ‘Divine’ construction.” God Bless America! @Heather – Talk about a straw argument! This comic completely misrepresents the opposition’s point of view. The issue with religious tolerance does not arise from people reading the Bible on their lunch break; rather, it stems from people who impose their faith on others. If you’re in uniform, you can’t create an environment where others feel pressured to conform to the same religion as you. I’ve never heard of anyone feeling pressured by someone reading the Bible on their lunch break. What I *have* heard of is people feeling pressured by those who actively try to convert others to Christianity. 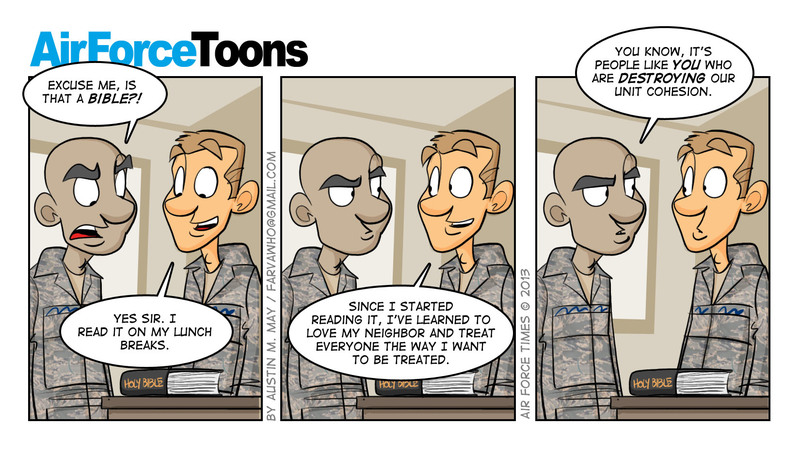 If someone did that to me, I would certainly categorize that behavior as harmful to unit cohesion! @Free Thinker – As in any form of “harassment,” the “victim” need only to “just say no,” and if the “harassment” continues, then the “victim” needs to report it and take the steps to treat it as a harassment case. If any Christian in the military is “forcing” his or her faith on anyone that has told him/her to back off, then he/she is in the wrong. If you have been “bullied” or *have* heard of people being bullied, then report it. You would be negligent to not report any form of bullying that you are aware of. As Christians, we may plant a seed in someone by sharing our faith, but we’re not taught to harass people into accepting our faith. Someone’s acceptance of the Christian faith is between that person and God, who works through a variety of avenues to reach us individually – many times through a variety of people, events, and challenges. I don’t believe many people have been “saved” through badgering or bullying. Living a Christian life as an example to others is the best “recruiting method” we have, and that doesn’t involve any hard cell tactics that may be recognized as harassment. I can’t imagine how someone reading a Bible during lunch and living a Christian life while serving our country could be harmful to unit cohesion. @Heather – There are times when the issue of proselytization can be handled at the lowest level possible, i.e. at the intrapersonal level. Usually, “I really don’t care what you have to say” will be enough to get people to back off. The big problem arises when a Christian shows up in another airman’s dorm room with a Bible in hand and insists on praying together to help the atheist airman to find God. It happens all the time. @Free Thinker – The “big problem” doesn’t sound like a big problem, at all. All the roomie needs to do is just say no, and if that doesn’t work, seek the help of an NCO. Counseling is all that should be needed to save the atheist from the overbearing Christian. Today’s military is much more accommodating than in days past. Harassment of any kind is not tolerated. Interesting how you mention an “atheist” as the person being victimized by the overzealous Christian roomie. Not all people who claim no religious ties are atheists. Sorry, Free Thinker, unless you can produce some actual data or real first hand experience with the aggressive conversion attempts by Christians in the military, I think you’re blowing smoke where there is no real fire. @Heather – The example I used *is* from firsthand experience. One of my good friends is a Christian who has tried to sway me, an atheist, and even several Catholics to change our religious lifestyles to be more in line with his. We didn’t seek help from an NCO because we were (and still are) all friends. But does it make us angry? Of course! Did it ruin a sense of unit cohesion? Absolutely! Because when he was in the running for a command position, we felt that our denial to conform to his religious beliefs would result in unfair treatment. Fortunately, we weren’t the only ones who noticed this, and he was counseled by his superior on the issue. Never had a problem since. Your argument is invalid because it rests on the principle that religious proselytization is based on a two-strike system; in other words, a Christian is entitled to one free shot at converting someone before it’s a problem. Would you say the same thing if someone sexually harassed a member of their unit? Do they get one free chance there, too? Or how about assault? Religiously-overbearing members of a unit – even after ONE conversion attempt – do degrade unit cohesion. Conversion attempts are bad – even if they only happen once. Period dot. @ Free Thinker – Now you’re equating someone bringing up their faith with another to someone who sexually harasses or assaults someone. Quite the extreme, don’t you think? I can see you’re steadfast in your beliefs, and this one incident you experienced has convinced you that it’s happening everywhere, or maybe you’d like people to believe that. It does not surprise me that you’re an atheist – I could tell from your first post. One day, I hope the right people or circumstances are brought into your life to open your heart to the reality that the God you’re so adamant to reject loves you. I’m not going to preach to you, because I’m sure you’ve heard it all before, and your heart isn’t ready. What I will do is keep you in prayer. I’ve planted a seed, regardless of what you do with it. @Heather – Again, you lapse into a straw argument. I’m equating only the tolerances associated with each type of harassment – zero. The severity of the reaction to each harassment should, naturally, be dissimilar as sexual harassment causes far more immediate harm than does proselytization. I don’t want people to believe proselytization happens everywhere, and I don’t subscribe to beliefs of the sort the MRFF perpetuates. I am saying that it does happen, and through firsthand and secondhand experience, I know that it damages unit cohesion. It is a problem. This comic downplays the seriousness of the problem by presenting a context which is far separated from the source of the issues we actually hear about today. The issues with religion ubiquitously center around Christians attempting to convert others who wish to have no part in Christiantity, not around people reading a religious text on their own time. You happily subscribe to the theme of this comic, and that concerns me because it shows that you – and certainly many others – have no clue what the real complaints are out there. The proselytization issues are not about people practicing religion on their own time; they are about people forcibly trying to convince others to convert to their religion. This is NEVER allowed to happen, EVER. Not once with a warning. NO means NO. And the military already says no, so there shouldn’t have to be another “no” from me! P.S. – I never said I was an atheist…I said “[he] tried to sway me, an atheist, and even several Catholics to change our religious lifestyles.” That means me, some other person who is atheistic, and several Catholics. But that’s beside the point; the point is you should learn to read a bit closer, but it’s in one ear and out the other, anyway. This comic disappoints me. This totally trivializes and makes a joke of the efforts of many to make sure everyone feels comfortable with the working environment and does not feel any undue religious pressure. Bad play Farva. Sorry you feel that way, Analyst, but the point was to trivialize and make a joke of the people who lump religion – Christianity, in particular – with sexist and hate groups, as one reader did in the last issue. I don’t feel a Bible left out on a desk is any more undue pressure to conform to religion than a cigarette lighter left out on a desk is pressure to smoke.